How do I wear blue eyeliner without looking like I am trapped in a bad 1980s movie? 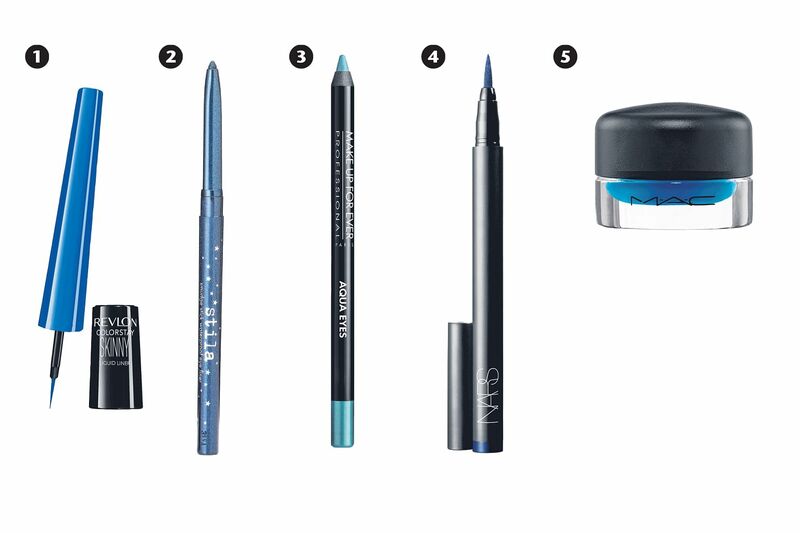 Bold blue eyeliner can freshen up a look in a way that a basic black eyeliner cannot. Cobalt blues and aquatic shades with a tinge of green can give the eyes an edgy urban twist. But, when badly done, blue eye make-up is often associated with gaudy 1980s dress-up and 1950s vintage style gone wrong. Keep away from pastel shades. They can be more tricky to wear and could go wrong quickly. Blue can be sophisticated and it can complement Asian skin tones, medium and dark skin tones as well as deeper eye colours. Use richer tones such as midnight blue or a cobalt blue if you want a jolt of colour. With a lot of the bold make-up trends this season, the key is to emphasise only one feature. A little highlighter on the cheeks and a light neutral lip colour should go with bold eyes. For those who are weary of looking dramatic, keep the width of the eyeliner across the eye the same as the pencil tip. For a look that is more fun than glamorous, end the eyeliner at the outer edge of the eye rather than creating a cat-eye flick. A long-wear liquid eyeliner that comes with an ultra-fine 0.1 mm tip for precise application. A vibrant blue shade that delivers an intense and highly pigmented eyeliner. Its slight metallic tone adds dimension to the eyes. A highly pigmented and creamy eyeliner that creates a rich and dynamic line on the eye. A navy blue shade complements any outfit. The non-staining formula does not flake after application and is smudge-proof after it dries. 5. Fluidline in Siahi, $31, from MAC, available at Tangs at Tangs Plaza. It will be available at all MAC outlets from April 1. The teal shade of this waterproof gel liner creates a fun and fresh look as opposed to a serious and formal appearance created by darker tones.